It’s been a good week for the bulls, as U.S. equities have been slowly-but-surely charging higher. It’s left many investors wondering what to do and if there are any opportunities left. Let’s look at our top stock trades to get an idea at what still exists. Qualcomm (NASDAQ:QCOM) stock has been on fire. Thought you’d never hear that again, huh? The company is now valued at $105 billion, and has a $30 billion share buyback plan in place. You do the math. After its failed bid for NXP Semiconductors (NASDAQ:NXPI), Qualcomm’s flush with cash and has even repaired its relationship (to a degree) with Apple (NASDAQ:AAPL). That said, shares have been red-hot and need to cool off. 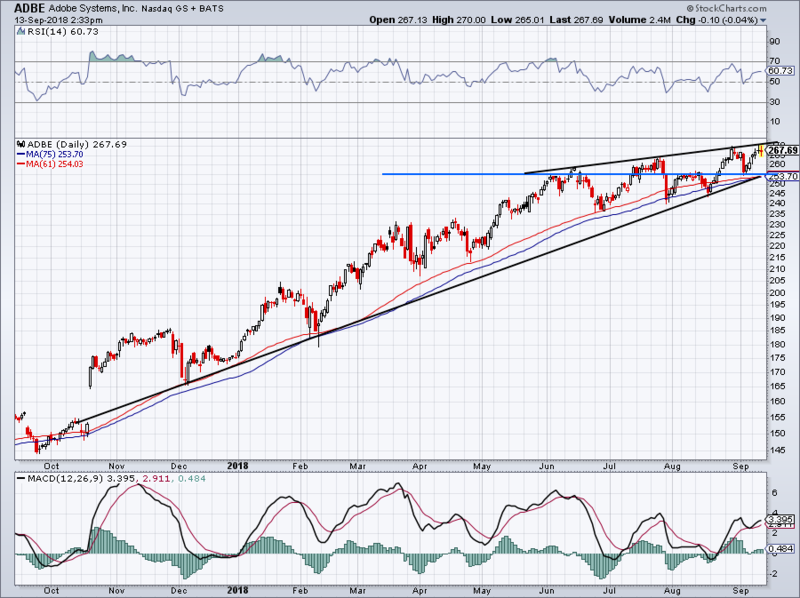 Uptrend support likely comes into play in the upper-$60s, as does prior big-time resistance. A decline to the $66 to $69 area becomes a must-buy for investors. This semi stock just won’t cool off and I already know it will become my stock of regret for 2018. While Advanced Micro Devices (NASDAQ:AMD) is our most profitable trade so far, we ended up selling far too early and left plenty on the table. We’ll remember that and try to apply what we’ve learned going forward. As for the stock, it’s meteoric rise continues. After rallying to $34 in the session, shares reversed sharply lower. That could be the blow-off top bears have been waiting for. Aggressive bulls can buy on a pullback to the 20-day moving average, while conservative bulls may wait for a decline to prior uptrend resistance (blue line) or uptrend support (black line). 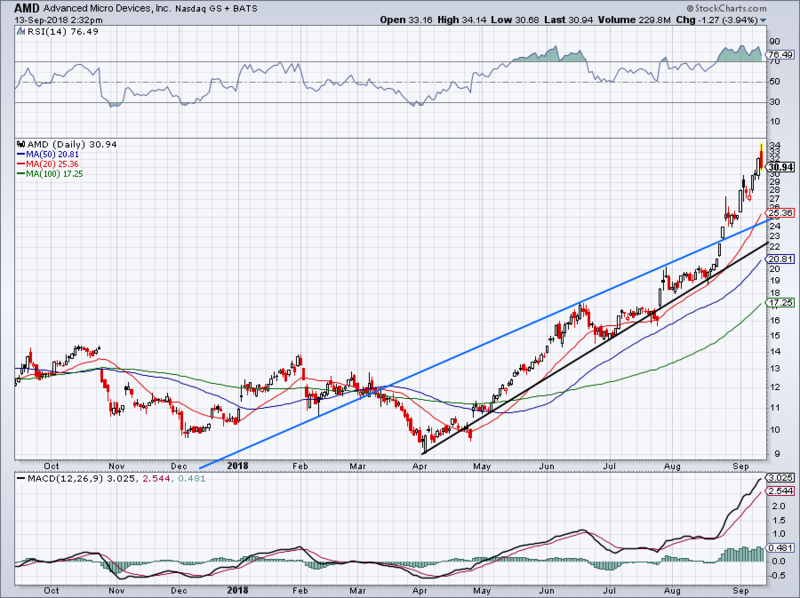 Adobe Systems (NASDAQ:ADBE) has been one of my favorite buy-on-dips stocks, along with Salesforce (NASDAQ:CRM). However, the former will report earnings after the close Thursday. We have continued to like Adobe on pullbacks into support, which have come into play near the 61-day moving average and the 75-day moving average. Both can be found near $255, as can uptrend support as well as level support. 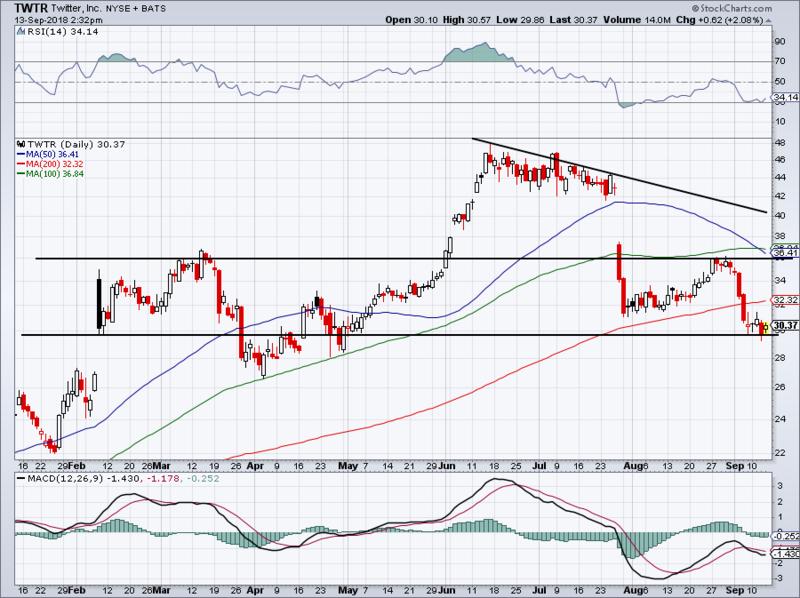 Should shares pullback and hold this level, I would consider Adobe a must-buy. 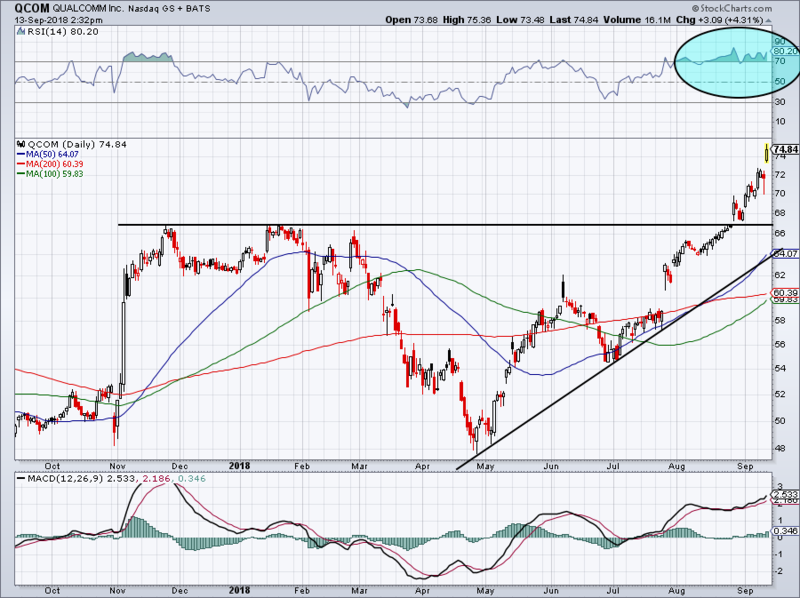 Adobe isn’t guaranteed to pullback, but it seems to be a familiar post-earnings reaction. A decline to $250 or lower would be concerning and we’d have to re-evaluate the charts. Facebook (NASDAQ:FB), Twitter (NYSE:TWTR), Snap (NYSE:SNAP) — it doesn’t matter. If it’s a social media stock, it’s been roughed up. With Twitter though, there may be an opportunity. Shares are hugging this level just below $30. Even though it’s below all three major moving averages, it’s looking attractive from the long side given that bulls have a clear risk/reward. On a close below Wednesday’s low, bulls can stop-out. 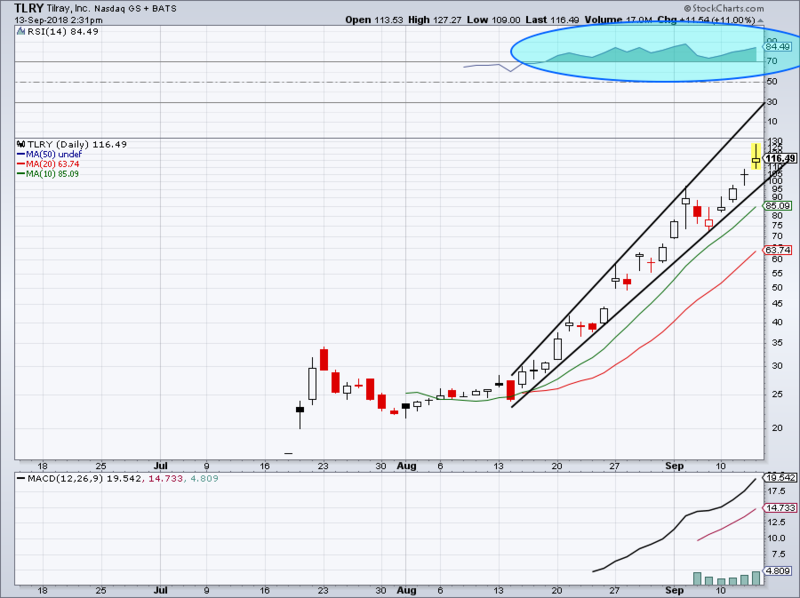 Should support hold and Twitter rally, target No. 1 is the 200-day, while target No. 2 is $36 or the 50-day moving average, whichever comes first. Like Canopy Growth (NYSE:CGC), Tilray (NASDAQ:TLRY) has been blazing up fat gains. Shares remain overbought, but that’s been the case for more than a month as shares have gone on to triple. Using the RSI (blue circle) with such a new company is almost pointless. Instead, look at the fundamentals. Keep in mind the company is expected to generate sales of $41 million this year, but sports an $11 billion market cap. If that’s not insanity I don’t know what is. Maybe support comes into play near $100. Maybe the 10-day moving average or 20-day moving average is where to buy. It’s unclear with this volatile of a name. But I know Tilray is not worth $11 billion as its current business stands and when combined with its parabolic nature, hopefully, new bulls don’t step in anytime soon. Bret Kenwell is the manager and author of Future Blue Chips and is on Twitter @BretKenwell. As of this writing, Bret Kenwell was long CRM. Article printed from InvestorPlace Media, https://investorplace.com/2018/09/5-top-stock-trades-for-friday-tlry-twtr-qcom-adbe-amd/.